In October 1986, a then little-known television company called FBC launched a new late night show starring Joan Rivers, who had once been a guest host for Johnny Carson on The Tonight Show. A year later, the company produced and aired one of television’s most successful sitcoms, Married … With Children, an irreverent and ironic look at the foibles of married life. By the end of that year, the little company that could blossomed into the FOX Broadcasting Network, owned by Rupert Murdoch, poised to challenge ABC, NBC, and CBS. This fascinating book provides a season-by-season sketch of the development of a new maverick network that made its name through its willingness to experiment with the tried-and-true forms of established network television. The author, the Boston correspondent for Variety, tells a compelling story as he explores the leadership of Barry Diller, a go-for-the-throat executive who pushed his early employees into success, and other executives who contributed to the stability of the network. 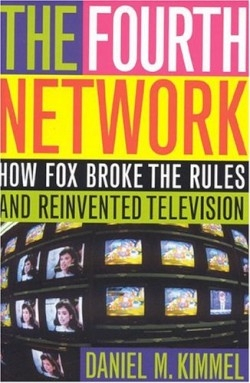 While at least one executive at another network criticized FOX as a “coat-hanger network” for its pastiche of programming, FOX emerged in the 1990s as a television power that could not be ignored. With brilliant programming strokes, the network ran a new animated sitcom, The Simpsons, against The Cosby Show on Thursday nights, and almost succeeded in attracting more viewers. FOX thrived on running edgy shows—21 Jump Street, In Living Color, Melrose Place, Beverly Hills 90210—that captured a large segment of the audience. By the late 1990s, FOX had developed such a name for itself that it was able to attract the NFL and NASCAR, adding to its reputation. Also, FOX first aired reality shows such as COPS and America’s Most Wanted in the late 1980s, making it the logical place to broadcast such programs as Temptation Island and Joe Millionaire. Kimmel’s riveting study offers not only a masterful account of the evolution of the FOX network but also a grand narrative of the politics of the television industry.